This artist's concept contrasts Vega with our own Sun. WASHINGTON, D.C.-The bright star Vega is whirling so fast that its equator is several thousand degrees cooler than its poles, scientists said today. The finding, owing to a strange phenomena called "gravity darkening," confirms predictions about the star. It could also force scientists to rethink their ideas about the amount of light Vega is shining on a dusty debris ring, called the circumstellar disk, which surrounds the star's equator and is thought to be a potential birthplace for planets. Vega is located 25 light-years away from Earth in the constellation Lyra. It is the 5th brightest star in the night sky and, because Earth's pole wobbles over time, it will take Polaris's place as the North Star in 14,000 AD. Vega makes a full rotation about its axis once every 12.5 hours. The Sun, in comparison, takes 27 days to make one rotation, even though it is much smaller than Vega. Using Georgia State University's Center for High Angular Resolution Astronomy (CHARA) array in California, researchers confirmed a prediction made by astronomer Richard Gray in 1985 that Vega is spinning at 90 percent of its critical rotation speed. Stars have a maximum speed, called the "critical rotation," at which they can spin. If stars exceed the critical rotation, the outward force caused by their spinning will overcome the inward gravitational force that keeps the star together. "If stars get to that limit, they will begin to fly apart," said Jason Aufdenberg, a postdoctoral researcher from the National Optical Astronomy Observatory in Arizona who was involved in the study. One major consequence of Vega's speedy rotation is that it bulges significantly at its equator: the star is nearly 23 percent fatter than it is tall. Because of the elliptical shape, gravity is no longer even across the entire surface. "For an ellipsoid, you actually have lower gravity when you're at the equator because you're farther away from the center of mass," Aufdenberg explained. Gravity in turn affects how much energy a star radiates, a measure known as flux. In regions of the star where gravity is low, like at the equator, the flux will also be low. This sets up a temperature difference between the star's equator and its poles. This is what scientists call gravity darkening. In the case of Vega, gravity darkening is causing its equator to be cooler by 4,000 degrees Fahrenheit than at its poles. The finding was presented here today at the 207th annual meeting of the American Astronomical Society. Scientists can't observe Vega's equatorial bulge directly because Vega is oriented in such a way that astronomers on Earth have only a pole-on view of the star. The new results, derived from the temperature data, could affect the way scientists think about Vega's circumstellar disk, Aufdenberg said. Many scientists are interested in the disk of gas and dust because it may be similar to those found around other stars. Circumstellar disks are thought to arise mainly from the collision of rocky asteroid-like objects and to form the starting material for the formation of planets and stars. 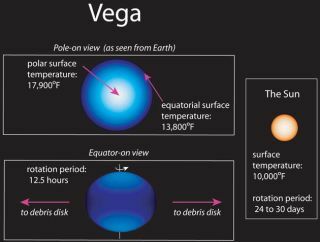 "Up until now, people have been modeling Vega's spectrum as we see it from Earth, but our measurements make it pretty clear that Vega's circumstellar disk sees a spectrum that is cooler," Aufdenberg told SPACE.com. Based on the new results, the researchers estimate that the amount of light Vega's circumstellar disk receives is only about half of what was previously thought. The change could require scientists to rethink how much energy is being absorbed by the dust and gas that makes up the disk. "If it's being heated up less than it was before, then that changes maybe the number of dust grains that have to be there or the type of dust that is there," Aufdenberg said.